Successfully Added DOOGEE X3 Smartphone - 2 SIM Cards, Android 5.1, Bluetooth 4.0, Smart Wake, Gesture Sensing, 1GB RAM + 8GB ROM (White) to your Shopping Cart. The DOOGEE X3 falls into the entry-level smartphone category mostly because of its attractive price. With that said, it does come with all the needed basics and a few fun extras to explore. First and foremost, you will have the upgraded Android 5.1 interface and access to the Play Store, where you can pick up more fun apps, games and tools. The phone also sports some of the latest navigation shortcuts: Smart Wake and Gesture Sensing. The 1800mAh battery comes with 6 hours of non-stop talk time and Bluetooth 4.0 insures smooth connectivity with other devices. 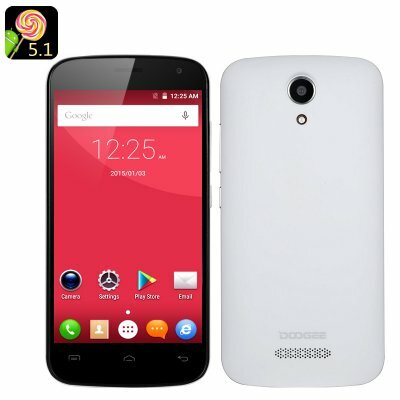 The smartphone is powered by the MTK6580 Quad Core CPU with the speed of 1.3 GHz. You will have 8GB of internal storage – and more (up to 32GB) with an SD card.The DOOGEE X3 comes with a nice sleek design and, thanks to its compact size, is super easy to operate. The 4.5 inch screen offers 854x480 resolution. It supports 3G connectivity, comes with two SIM cards, an FM radio and two cameras.